Much like our feathered friends, we should be preparing for migration. A new version of SharePoint sees a large spike in the number of migrations, as people move forward to take advantage of the new functionalities on offer. This is especially true with SharePoint 2016, as there’s a lot of stuff to love in terms of new features. A failed migration could leave users unable to work and end up being very counterproductive, but if you put in the hard work beforehand it will ensure the process runs a lot smoother. So, we’re here to make sure you do everything you can to prepare to take flight. In its simplest terms, a SharePoint content audit is designed to leave any outdated or unimportant content behind in the old system. You may think this is rather self-explanatory, but reducing the scope of migration is something a lot of companies neglect to do. Be strict with what you want to keep; the most effective way to reduce the hassle of migrating content is to migrate less. For those not familiar with the 80/20 rule, it stands for 80% of your employees will use no more than 20% of the content on your intranet. For that reason, it’s a good idea to identify that core 20% of content, and make it the first thing you migrate over. In the wise words of Creighton Abrams, “When eating an elephant, take one bite at a time.” While we’re not advocating anything of the sort, when you’re dealing with a lot of content, it’s best to do it slowly and carefully. In practice, there are 3 main methods of migrating content: Manual, Automated or a mixture of both. Automated would require no manual effort, but the extra technicalities mean it can only be determined on a case by case basis, and thus it isn’t feasible for every project. Manual migration is the simplest to perform, but equally the most painful; a monotonous process of cutting and pasting and copying content. So your best bet is a partially automated migration – the best of both worlds. Even if some areas are too old quality-wise, there are likely to be other areas or types of content with a greater structure that are fit for automated migration. A good automated migration approach will, more often than not, respect the security of the old system. Using a more manual approach, you'll need to be more careful to make sure previous security policies are adhered to. Also when moving content to the cloud, be careful what's appropriate for this entirely different domain and what isn’t. Once a SharePoint migration is complete, the real work often begins. Post migration tasks (cleaning up page layouts, checking links, ensuring security and permissions are ok, ...) can be the difference between a great migration and a poorly executed one. If you're creating a fresh SharePoint 2016 instance and farm, consider the updated hardware requirements. Does your farm stack up? See the official hardware requirements under "System Requirements" on Microsoft TechNet. You cannot upgrade from SharePoint 2010 directly to SharePoint 2016. You must upgrade to SharePoint 2013 first. For those of you still working with 2010, don’t fret. 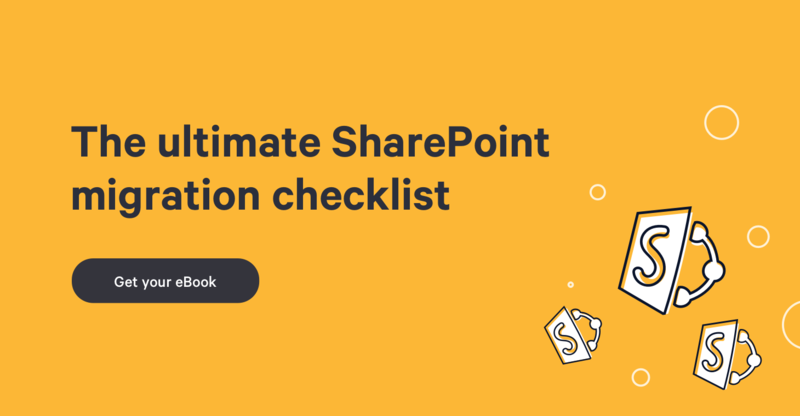 Once you have upgraded to 2013 the process after that is less painful than you think because… Or, of course, a third-party SharePoint migration tool like Sharegate could do it directly, thus skipping the extra step. If you're running SharePoint 2013, then you can use the "in place upgrade", and perform a "database attach" method to upgrade to 2016. This means you first create and configure a SharePoint Server 2016 farm, and copy the content and service application databases from your 2013 farm, then attach and upgrade the databases. It’s as easy as that. If you're going to take advantage of the new cloud features in 2016 (like using OneDrive for Business in the cloud), you need to fully audit what content is moving on up. Can it go to the cloud? What are the legal and audit implications for your company? 10Gb is the new soft limit for file sizes in SharePoint 2016. Any good migration should involve a content audit (see above). But in this case, you may be able to move content onto 2016 that otherwise would not have worked (and might be sitting on now unnecessary systems). A SharePoint Migration is always an exciting, yet stressful, time. With the above considerations, you should be able to spare yourself a whole lot of trouble. Are you planning on migrating to SharePoint 2016 right after its release, or waiting for the dust to settle?